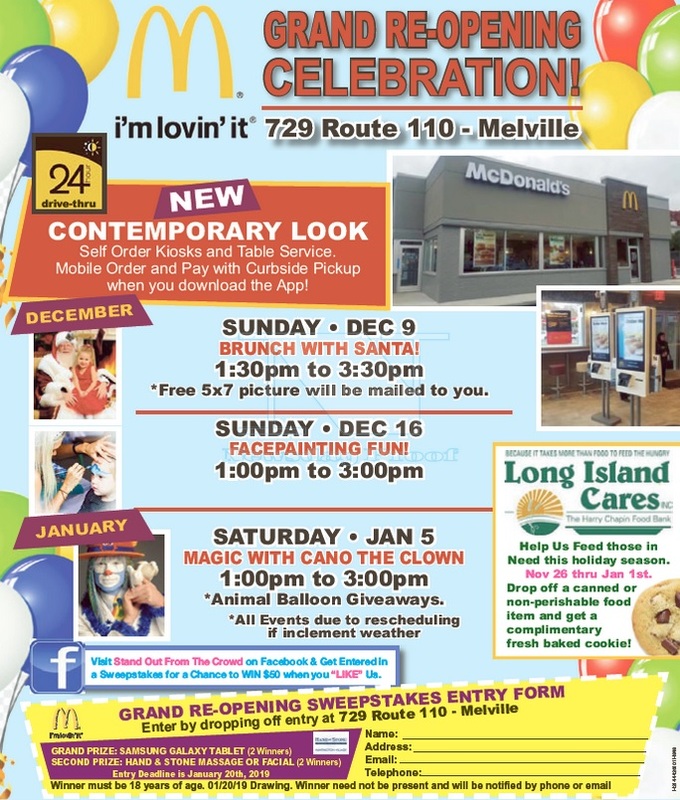 Subject: LongIsland.com - Your Name sent you Event details of "Brunch with Santa - McDonald's Melville Grand Re-Opening Celebration"
McDonald's in Melville is excited to present "Brunch with Santa" as part of its Grand Re-Opening Celebration! The event, held on Sunday, December 9th, will feature a delicious breakfast and the ability for children to take a free picture with Santa (5x7 photo will be mailed). In addition to the Brunch with Santa event, there will be Face Painting Fun on Sunday, December 16th, and Magic with Cano the Clown on Saturday, January 5th! Also, be sure to stop by between November 26th and January 1st with a canned or non-perishable food item for Long Island Cares and received a complimentary fresh-baked cookie!